The Raspberry Pi organisation has released a pair of matching input peripherals for their eponymous bare-board micro computer. One might be surprised that there hasn't been any official mice and keyboards thus far - but they are now available and there are some appealing colour options too; white/(raspberry) red, or black/grey. This is a compact 78-key keyboard, as you can see. It boasts key features such as; a microUSB connector to the Pi, a 3 ports USB Type-A hub, three lock keys with corresponding LED indicator lights, and a dedicated Raspberry key to the lower left (where otherwise you might have found a Windows key). In a blog post the Raspberry Pi org said it selected the "best USB hub IC we could find, and we worked with Holtek on custom firmware for the key matrix management". 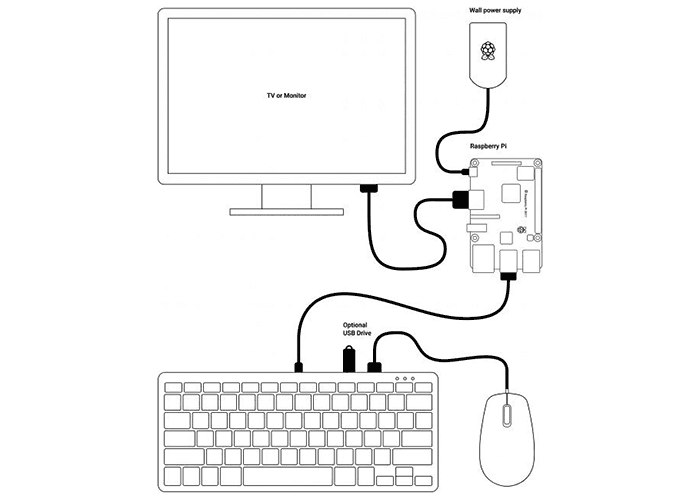 If you are connecting this keyboard to a Raspberry Pi it is recommended that you connect it up as in the example diagram below. This way to is easy to connect things like thumb drives to the keyboard and minimise the mouse tail spaghetti. 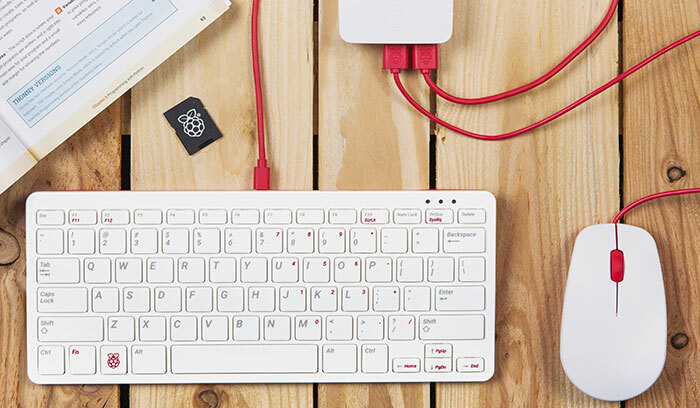 The official Raspberry Pi keyboard is available now in a choice of white/red, and black/grey, depending upon the layout you choose (UK, US, Germany, France, Italy, Spain with more to follow). For example, there don't appear to be any of the black/grey keyboards available in the UK layout at the time of writing. I found the keyboard listed at £15.60. The Raspberry Pi mouse has also been thoughtfully designed rather than just created by sticking the company logo on a generic input peripheral. In this case the designers have kept the button configuration simple; a left and right mouse button plus a clickable scroll wheel. However the mouse comes packing high quality microswitches from Omron. Weight has been adjusted for an easy but positive response. Unfortunately I couldn't find information about the optical sensor used by the mouse, or related specs. Again available in white/red, and black/grey, this mouse features a subtle Raspberry Pi logo embossed on its base and the USB connector. On its own it costs about £7.30. I found the Raspberry Pi keyboard and mouse combo starter pack available here in the UK for £22. Shipping costs depend on location. People have already modded the keyboard to fit the Raspberry Pi inside. Hopefully this will become a real option in the next generation of the keyboard. People have already modded the keyboard to fit the Raspberry Pi inside. Hopefully, this will become a real option in the next generation of the keyboard. I Don't think that there is a need to have a package, but the ability to put it in would be appreciated. The only interest would be if you could fit the board inside. Otherwise, what is the point? lol, seems we all want a keyboard case (80's style). It does look like a nice keyboard though, and I do like an integrated USB hub. Looks good for the price, i'll certainly be sticking this on my wishlist.